In a way it was pleasingly ironic that biting cold and wind on Dec. 9 made outdoor work a challenge for those, like Campus Construction Update, who don’t do it very much. That’s because the event that drew us over to the Cutten Maintenance Center parking lot was all about heat: a new fuel for heating Bates people while reducing the college’s role in global warming. On that frigid Friday afternoon, Bates energy manager John Rasmussen was among those watching Cote Crane and Rigging, of Auburn, erect a new heating-fuel tank next to Cutten. 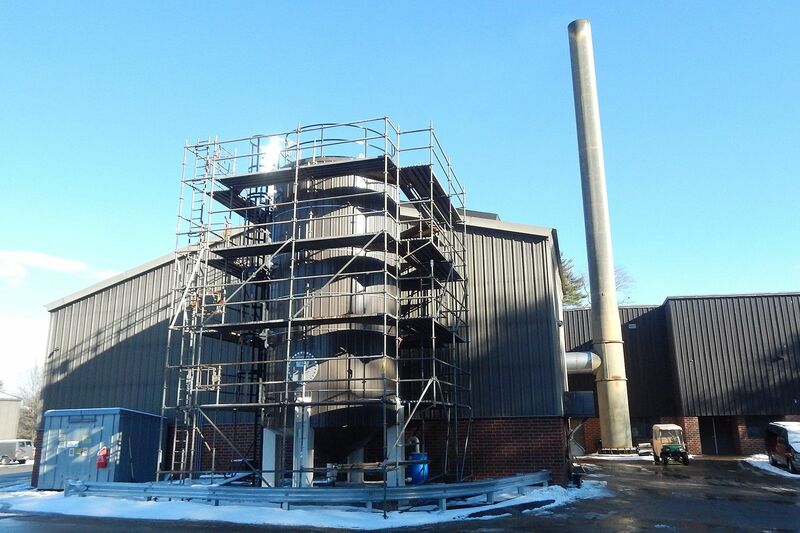 It was one of the final steps in the conversion, which Rasmussen managed, of one of Bates’ three central boilers to burn so-called Renewable Fuel Oil, a sustainable fuel sourced from woody plant material. Making steam that warms most of the heart of campus, about 1.1 million square feet of interior space, those boilers are historically responsible for a big share of the college’s greenhouse gas emissions. Since Bates switched from natural gas to RFO for its primary heating fuel, on Jan. 10, those emissions have shrunk by roughly 83 percent. In the 1980s, the Canadian company Ensyn Technologies developed a process for rendering oil, so-called biocrude, from biomass. Like crude petroleum, biocrude can be refined into a variety of products — in fact, the company’s earliest commercial successes include the food seasoning Liquid Smoke. Although it resembles Liquid Smoke in its dark brown color and smoky odor, Ensyn’s Renewable Fuel Oil does not belong in your barbecue sauce. 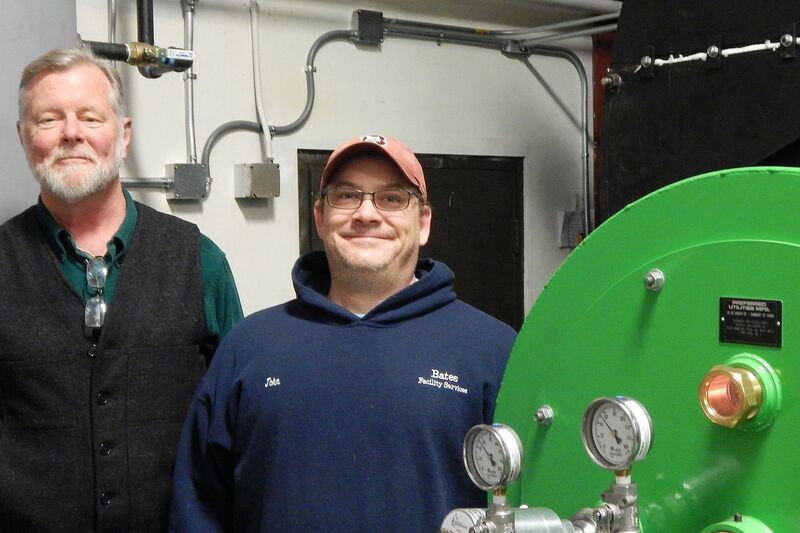 But it’s great for fueling industrial boilers, and Bates’ switch to RFO makes the college the first educational institution, and only the third institution of any kind, in the U.S. now heating with it. Because RFO is not a fossil fuel, burning it does not release fossil carbon into the atmosphere. Bates sustainability manager Tom Twist estimates that in a typical year, burning 70 percent RFO will cut the steam plant’s emission of carbon dioxide equivalents (CO2e) from about 3,080 metric tons to 532. That cut in emissions would reduce the college’s annual CO2e total, in recent years about 9,000 metric tons, by 2,548, or nearly a third. “It’s a huge drop, which is pretty cool,” says Twist. RFO is also saving money for Bates, thanks in large part to the Environmental Protection Agency’s Renewable Fuel Standard program, which helps renewable fuels compete with fossil fuels in the marketplace. 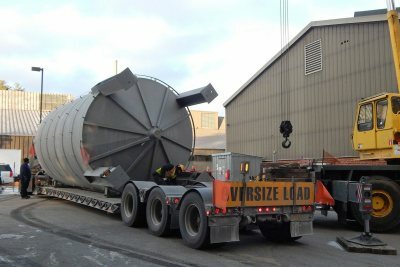 Twenty-nine feet tall and holding 20,000 gallons, the new tank is the most conspicuous evidence of Bates’ conversion to the Ensyn fuel. Thanks to various adventures in transport, including the non-local truck driver’s getting lost in Auburn, the Dec. 9 delivery was late and the sun was setting by the time the tank was offloaded. In setting up the tank, a more agreeable kind of drama emanated from Cote’s elegant choreography with two telescoping-boom cranes. 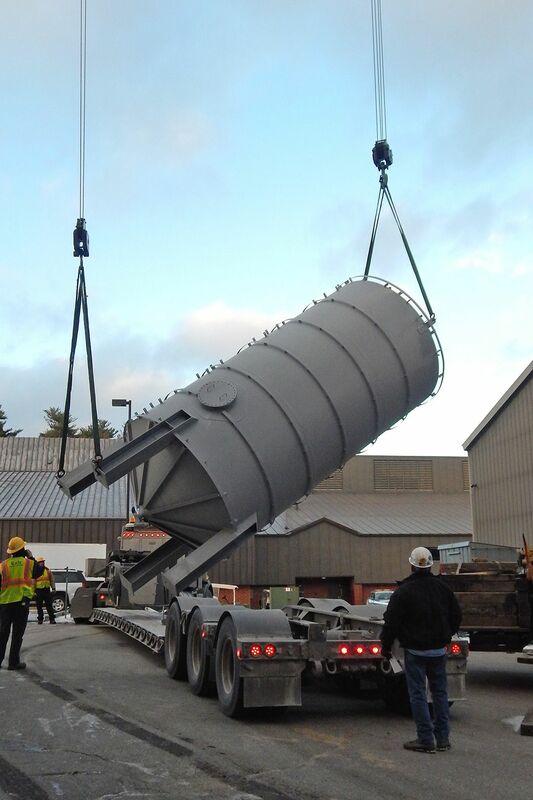 One hoisted the top of the tank and the other steadied its base, they turned it upright, and then one crane set it on its concrete pad next to Cutten’s western wall. Through the ensuing weekend, under the supervision of Lincoln, Maine-based general contractor Fastco Corporation, technicians in various trades connected pipes, wired up sensors and instruments, and installed handrails and other fittings. Later the tank was wrapped, first, in thermal insulation and then in sheet metal similar to the siding on Cutten. 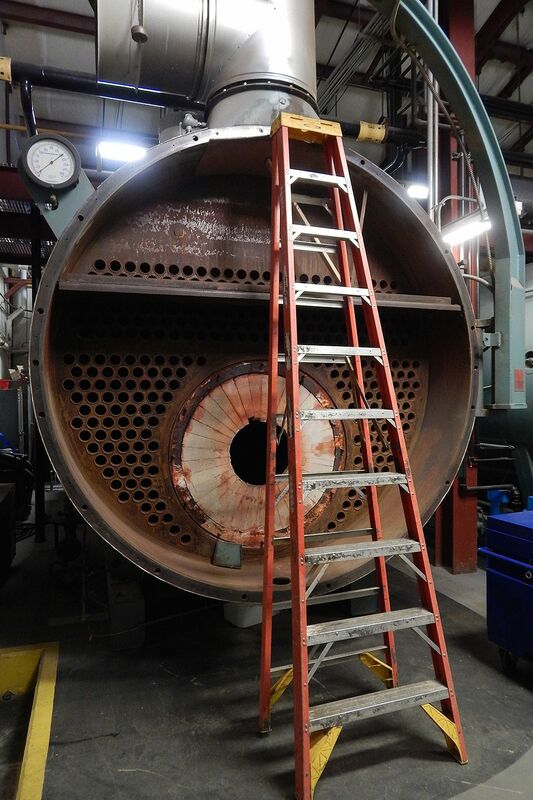 The first RFO was delivered Jan. 4, and several days of testing, tweaking, and curing the ceramic liner of the combustion chamber preceded the formal start of RFO service on the 10th. Of course, there was more to the $1.1 million conversion project than the tank. The burner, on the college’s No. 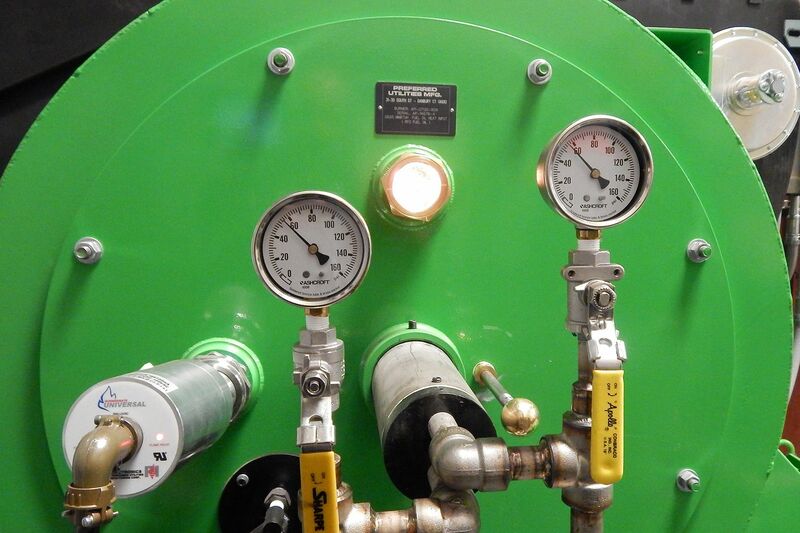 1 boiler, is new — a large green contraption, built into the boiler front, in whose center is a little porthole through which you can watch the fierce yellow-orange flame of RFO combustion. Ensyn ships RFO to the college from Renfrew, west of Ottawa. Once the system is broken in, says Rasmussen, the steam plant will burn about 4,700 gallons of RFO daily, with deliveries scheduled every day except Sunday during the coldest weather. 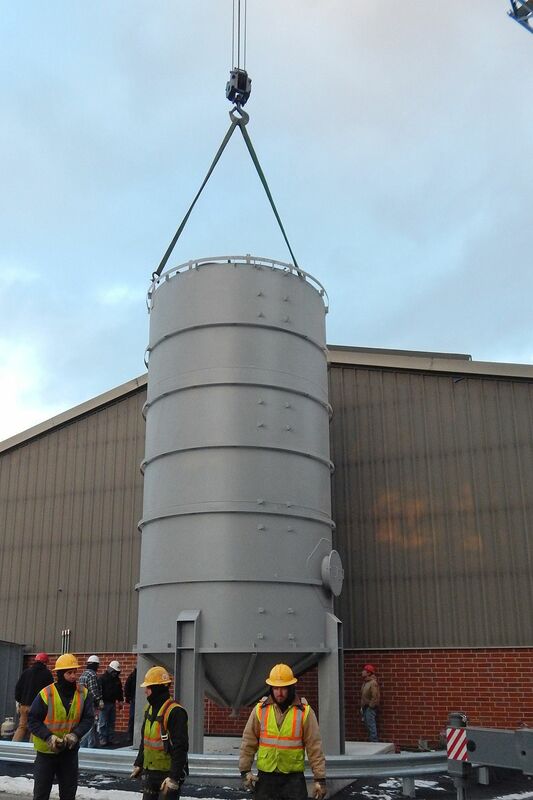 Although Bates followed standard fire-prevention practices in the design and installation of the system — a flame arrester at the top of the tank, fireproofed legs supporting it, and so on — “RFO really won’t burn” outside its preferred combustion environment, Rasmussen says. So RFO, like heavier grades of petroleum fuel oil, needs some cajoling to be combustible. (It takes more than a discussion of contemporary politics.) It must be heated to 160 degrees and atomized with pressurized air by the time it reaches the fuel injector. Doing that work is a series of heat exchangers, compressors, pumps, etc. occupying four equipment stations, or “skids,” on two floors of Cutten. The Burning Sands: As if the carbon curtailment and the Liquid Smoke angles weren’t compelling enough, we were intrigued to learn more about the proprietary technology that Ensyn uses to make RFO and other products. Called Rapid Thermal Processing, it’s a variant of a chemical process called pyrolysis. Pulverized woody biomass is blown into an oxygen-free chamber together with very hot sand. In just seconds, the heat breaks the biomass down into vapors, gases (not the same thing as vapors), and char. The vapors are condensed into pyrolysis oil, aka biocrude, while the gases and char are recycled to dry the feedstock and reheat the sand — pretty efficient. Bates’ energy manager first heard from Ensyn in February 2015, a month and year when heating was on every New Englander’s mind. A company rep cold-called Rasmussen on the same day he was about to take a major step forward with plans to convert the steam plant to wood chips — which would have cost about $10 million. Rasmussen was intrigued, and Bates ultimately signed a seven-year contract with the fuel maker. Tom Twist started work as sustainability manager as Rasmussen was developing Bates’ plan for converting to the new fuel. “I had a little bit of nervousness about it, just because so few places are trying RFO,” Twist says. Can we talk? Campus Construction Update welcomes your questions and comments about current, past, and future construction at Bates. Write to dhubley@bates.edu, putting “Campus Construction” or “Liquid Smoke!” in the subject line. Or use the 21st-century commenting system below.